Greg Cristiano has retired and closed his business. 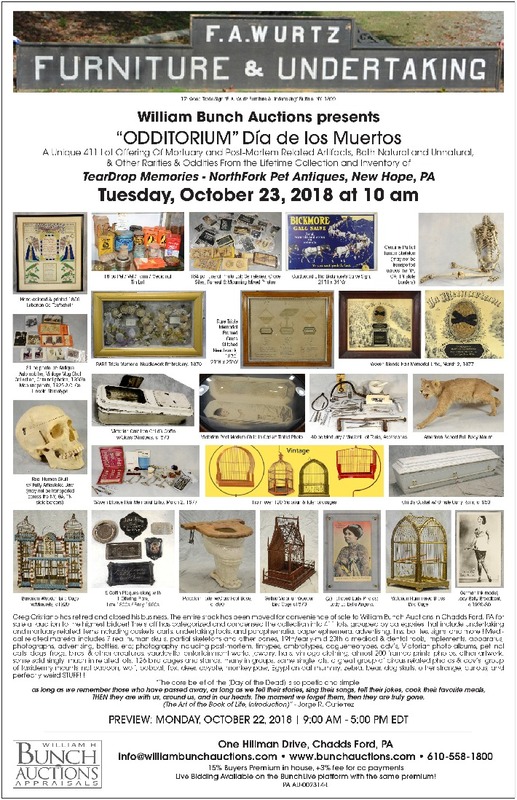 The entire stock has been moved for convenience of sale to William Bunch Auctions in Chadds Ford, PA for sale at auction to the highest bidder! The staff has categorized and condensed the collection into 411 lots, grouped by categories that include undertaking and mortuary related items including caskets, carts, undertaking tools, and paraphernalia, paper ephemera, advertising, tins, bottles, signs, and more!! 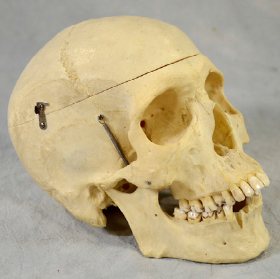 Medical related material includes 7 real human skulls, partial skeletons and other bones, 19th/early-mid 20th c medical & dental tools, implements, apparatus, photographs, advertising, bottles, etc; photography including post-mortem, tintypes, ambrotypes, daguerreotypes, cdv’s, Victorian photo albums, pet incl cats, dogs, frogs, birds, & other creatures, vaudeville, entertainment world, jewelry, hats, vintage clothing, almost 200 framed prints, photos, other artwork, some sold singly, much in related lots, 126 bird cages and stands, many in groups, some single lots, a great group of circus related photos & cdv’s, group of taxidermy mounts incl baboon, wolf, bobcat, fox, deer, coyote, monkey paw, Egyptian cat mummy, zebra, bear, dog skulls, other strange, curious, and perfectly weird STUFF!!!!! as long as we remember those who have passed away, as long as we tell their stories, sing their songs, tell their jokes, cook their favorite meals, THEN they are with us, around us, and in our hearts. The moment we forget them, then they are truly gone. Live Bidding Available on the BunchLive platform with the same premium!